My Twitter furrend Jessie Janey, who lives in the land Down Under, is a champion mouser. Yes, she is! How big a champion? She keeps a journal and since November 30, 2012, JJ has successfully caught 55 mice and 3 rats. In fact, once she even deaded an evil VC when one of her prey got caught in it! She's an indoor/outdoor cat of great charm and beauty. Here is a picture of her with number 20. Jessie with a real smousy that she deaded. I nominate JJ as Mouser of the Year. Austin and Kozmo might disagree but I'm sure her beauty will win them over. Me and my plague ratsy which I deaded. It's not often I play with cat toys but TW caught me going wild for a little white smousy. Let's roll the videotape! 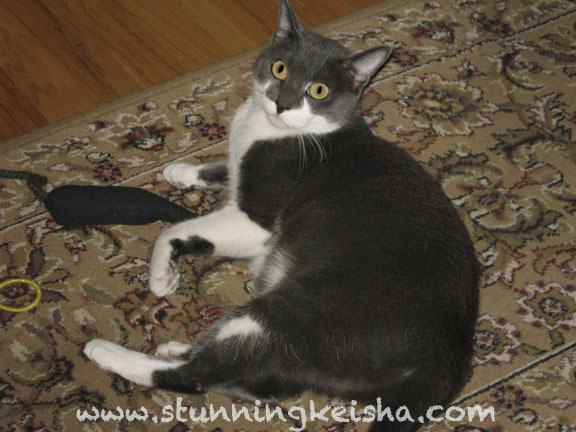 Please nominate this little ghetto kitteh's blog—www.stunningkeisha.com— for a Petties Award in the Funniest Blog or Blogger category and help your favorite shelter win a $10,000 grant. It's win-win. Go to http://petties.dogtime.com/login to nominate. Wow! That's some wild action, CK! Wow. That white mousie drove you WILD CK! I had to watch your little movie a few times to fully appreciate your finesse. Whew--is it hot in here? CK, I bet that if you had the chance, you would be a pretty awesome mouser too! Shiner just met Jessie Janey at the viking #nipclub pawty over the weekend. That's quite the record of mouse catching she's got. If KKMM were still alive, I think she'd have that beat pretty easy though =P She's caught at LEAST 55 rabbits plus mice and rats. And she ate all of them... except one body part which I think were kidneys? lol idk... gross but I always found it kinda weird. Whoa, Jessie gets to play with *real* mice? It looks like you like your mousie plenty, though, CK. 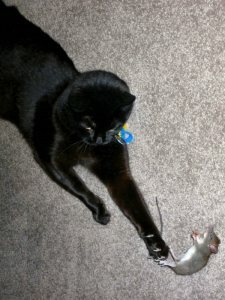 LOL Jessie is one cool mouse catcher. Keisha you go get that white smouse. Have a wonderful Wednesday. You asked about the transport kitties - they get food and water during the exchange to the next leg and have piddle pads in the carriers that are changed as needed. Wow Jessie looks such sleek and elegant girl! And she is a mighty hunter! Dang! Jessie sure is a great mouser! high paws N headbonks...ratz..ouch...noe mice...two ewe jesse ..ewe IZ de champion mouzer rooler oh de werld !!! N CK.....way awesum mewvie...we gived it 25 paws up for actshun N suspense N mor actshun !! You are pretty good at the mouse whappin' too CK! You look fierce and mighty there on the bed. I am just like you on my mom's bed. I love whapping things on it. I whap stuffs on the floor too. Wow, she's caught that many mousies and rats?? We've never even caught one! Real one, at least. MOL! Your video was funny! Jessie is a true champion! It was so nice to see you play with the little cat toy! Maybe more to come? That JJ is a true mouser!! I didn't realize her numbers were that high. he he - I should hang out with her - I'd never starve. You are a champion too sweetie. It's the stoopy America's Cup (yacht) race that the city was suckered into spending about elebenty billion dollars on hosting and now there are only like three teams (NOT 15) entered and it's all the biggest boondoggle EVER and instead of making some pie-in-the-sky Humungous Profit the taxpayers are going to eat dirt. That is a whole lot of mousies to catch. We rarely get them anymore. CK, we loved seeing you play! And that is a pawsome record Jessie has. Our Carl once caught 3 mousies in 20 minutes. The mom thought he was picking the same one out of the trash, until she saw all the bodies. Sadly we moved away from that house and haven't seen a mousie since. Is that neglect? Maybe it should be! Wow, she is a beauty and quite the mouser for sure! CK, we love watching your videos, and that was sure a cute one with your white smousey! MOL...CK, BFGF, I don't often let Mom catch me playing by myself either...don't want her out of practice spending every spare moment she has waitin on me. I will hustle over and nominate you for sure! Paws crossed! That's a lot of mice! Pippin sometimes gives a mouse to me. 55 mousies and 3 rats ??!! Jessie Janey sure are one GREAT Champion Mouser !! I bet you to had caught many live mousies if you hade the chance CK ! You've got the MOVES, CK!!! No one better get in the way of you and your mouse! ...ok, you and your anything! We think that Jessie ought to be the Mouser of the Century!!! 55??? And 3 RATS??? Holy Cod. Well, okay--I guess compared to that wild and rather unladylike performance with white mousie, I *was* a little bit of a lazy player with my fev-ver. But a boy can't be leaping around ALL the time.